I began riding my bike Monday to the Metro-Rail station, as I used to do years ago. I have rented one of the bike lockers at the station there, which keeps the bike safe and dry. 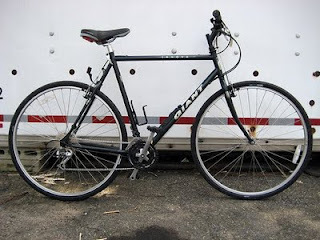 The bike pictured above (and the one at this link) is the same model as I bought, but I had mine outfitted with fenders and a rack. I ordered from REI a new set of panniers, a rear light, and a bell. Sunday I took my set of lawyer's uniforms down to the office, and I change when I get there. I commuted this way during the time that Macon, Walter and Mary were in high school and needed a car. So I left mine at home for them and took the bike and train, saving the expense of a third car. I appreciated the kids being OK with that. We've always enjoyed bikes in our family, taking them with us on camping trips to North Carolina (Cade's Cove in the Smokies was a wonderful place to cycle), trekking down to Matheson Hammock along Old Cutler Road below Coral Gables, riding around the Springs (I especially remember the trips we took with visiting missionaries when we had the missions conferences at church, led by Ed Roberts, an Elder, Walter's Sunday School teacher, and a seasoned biker), taking the Highlands Hammock State Park circle through the swamp at midnight with Jack and Bob in the pitch, pitch black, and making round trips on the bike trail from the Shark Valley entrance at Everglades National Park, seeing dozens of alligators disturbingly close and even more waterfowl. It's been fun to see Doug and Sue's bike photos on FB, taking fabulous trips in the Rockies. I recall the bike photos of them, Kellsey, and Macon on their grand trip to Hawaii years ago, pedeling up and down the volcano road. Last Saturday when I picked up the new bike at Cycle World and as we walked it out to the car, I asked Carol whether it was Christmas. It felt like that.